To critics of the London band Toy (including myself) a few songs aside, there has often been something about their music that’s never quite clicked into place. 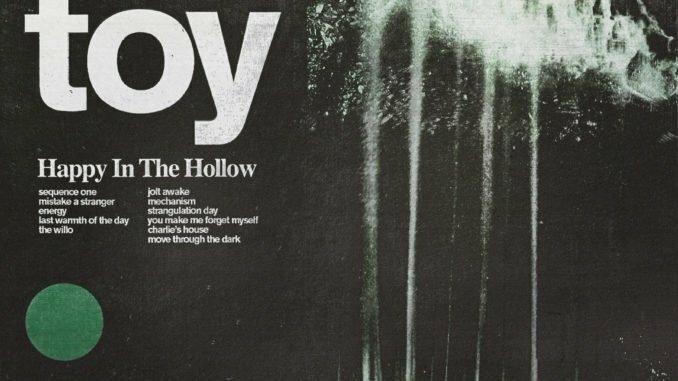 However, after a four-year absence, the group’s fourth album Happy In The Hollow presents a reinvigorated unit who have finally come into their own. While previous records sometimes lacked a sense of immediacy, their fourth LP is still something of a slow burner, but one that reveals a flame that’s brighter than ever. The opening Sequence One has a cosmic military flavour providing the anchor as strange, alluring mists rise to the surface, and the ghostly Mistake A Stranger entices with its gorgeous synth patterns, gradually opening out to blend the organic with the voltaic. Energy begins with a burst of cacophonous krautrock that acts as a launching pad for its wild flight before the shadowy ripples of Last Warmth Of The Day offer a sound that blends Syd Barrett vibes and guitars reminiscent of Urge Overkill into a hazy brew of acid folk. The Willow evokes a gentle, mysterious nighttime breeze with its delicate drum machines and dusky notes, very much at home with the nocturnal ambience of this record. 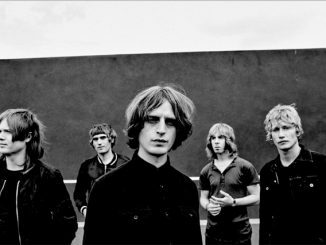 Stone Roses basslines, Cramps-like surf guitar and a superb drum sound combine with electronic texture and shimmering waves of vocals on the sturdy groove of Jolt Awake, a metronomic piece that matches human music to machine music with brilliant effect. It’s also a fine showcase of the album’s inviting analogue sound, achieved through the band becoming a self-sufficient unit and taking full control of the recording techniques. Mechanism bounds along with ‘Common People’ keys, and dives into a melting, vapour trailed rush of a chorus before the fuzzy pads and sparse psychedelia of the melodic Strangulation Day evoke 80s industrial pop tones. Then there’s the stunning recent single You Make Me Forget Myself, which is probably the most beautiful thing the band have ever produced; a swooning melancholic daydream sung wonderfully by bassist Panda Barron, who also penned the song’s lyrics. Drawing from a larger palette of sounds and influences, the wondrous acoustic patterns of Charlie’s House intertwine wonderfully to create a music picture reminiscent of an attractive wintery snow scene. This colourful, hazy and seductive album closes with more Stone Roses flavours on the deep, sumptuous Move Through The Dark, an uplifting lysergic epic that uplifts while bathing in a warming glow and impresses with its effectively layered instrumentation. Wider in scope, with stronger melodies and characterised by hugely efficient arrangements, Toy’s sound is now sprawling outwards from their psychedelic ground to cover more territory. Firmly in their groove and sounding more confident, the band are now mastering their craft and have scored a winner with Happy In The Hollow.